Hugh is a robot librarian created by Pasi William Sachiti and Ariel Ladegaard, two robotics students at Aberystwyth University. A walking, talking library robot could soon be lightening – or removing – the human librarian’s load after a prototype was created by robotics students. “Hugh”, an artificially intelligent library catalogue, will be able to take verbal book requests, work out where the hard copy is and lead students to the relevant bookshelf. 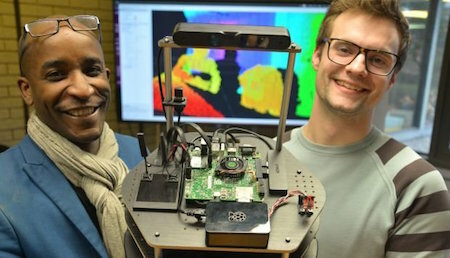 Pasi William Sachiti and Ariel Ladegaard, the robotics students at Aberystwyth University who created Hugh, combined existing robot technology with information from the university’s online library search facility to create their brainchild. A Filer is an amazingly intelligent robot and there aren't many being manufactured. You'll find them only in the greatest libraries, dealing with only the largest and most complex collections... The cataloging of human information has always been an incredibly complex task.